First- to sixth-graders from the Bedouin community of Al Muntar have received a three-week reprieve. During this time, they’ll be able to study without fear that bulldozers could show up at any moment and raze their West Bank school to the ground, turning it into a pile of bricks and timber. The reprieve – an interim injunction that freezes demolition orders previously issued by the Civil Administration – was handed down by Supreme Court Justice Uzi Vogelman last Wednesday, less than 24 hours before the demolition was scheduled to take place. What will happen after these three weeks elapse? Everything is in the hands of Allah, says Umm Ayish, a 55-year-old grandmother whose children and grandchildren dropped out of school because the only institutions were sited several hours away on foot or by donkey, accessible only via slippery and steep paths. In addition to Allah, the fate of the school also lies in the hands of the High Court of Justice, the Civil Administration and the Coordinator of Government Activities in the Territories. Will they be persuaded that even the children of this Bedouin community in the Judean Desert are entitled to regular studies under reasonable conditions – without reaching school tired after an early wake-up call and a long journey on steep paths; and without having to return home after dark with no power to generate the light by which they might do homework? On Wednesday morning, hours before the reprieve was announced, pupils’ voices could be heard coming through the windows of the condemned school as some of their fathers and brothers sat on a nearby hill, reminiscing about the hardships they underwent trying to get an education. Most of them dropped out due to the difficulties of getting to the elementary school located in Wadi Abu Hindi, a community situated 3 kilometers (1.8 miles) to the north, and the high school in Al Sawahra, some 15 kilometers to the west. 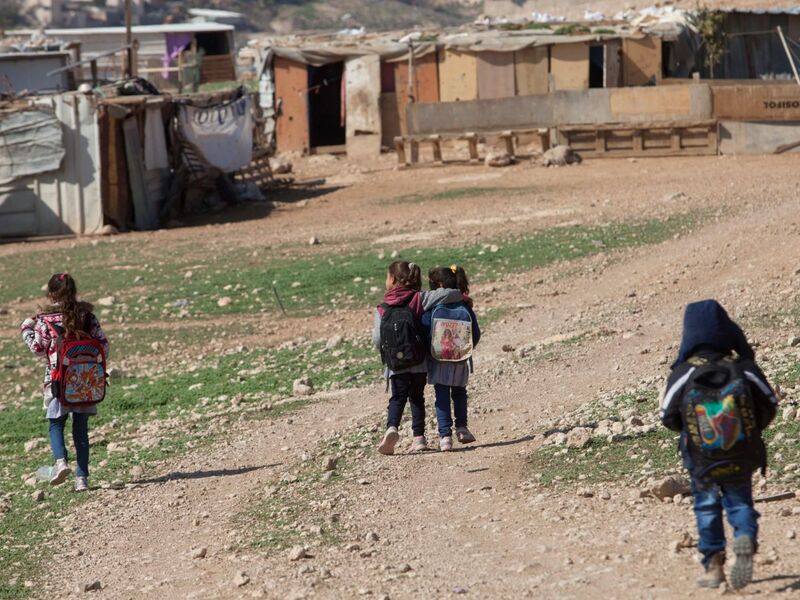 The Palestinian Authority’s Education Ministry appointed a principal and teachers, who travel in together daily on a pickup truck that trundles along the rocky and unpaved road. It was also decided to dedicate one of the rooms to a permanent clinic. Currently, the community has a mobile clinic that visits only twice a month. However, like all Bedouin communities in the area, the village of Al Muntar is not recognized by the Civil Administration. Some of its residents, hailing from the Al Sawahra area, have been living here since before Israel was established. Most of the village’s residents belong to the Jahalin tribe, which was expelled from Tel Arad in 1948, subsequently settling on the edge of the Judean Desert in the early 1950s. Abu Hassan was born in Al Muntar in 1968 and is a son of these refugees. When he was 7, he witnessed the start of construction in Ma’aleh Adumim. The years passed and Ma’aleh Adumim expanded, leading to further waves of expulsion. In 1990, the settlement of Kedar sprang up right across from Al Muntar. The area had already been declared a closed military zone, though no military exercises are conducted there. The structures and sheep pens in Al Muntar have been torn down several times and the flocks confiscated. But the residents were determined to remain in the place that has been their home since the ’50s. A few years ago, they negotiated with the Civil Administration to try to find a way of staying; it was agreed they would not be evacuated. However, any construction – including public buildings such as schools or clinics – remains prohibited. In December 2016, inspectors from the Civil Administration placed stop-work orders on the kindergarten (which was already operating) and a school being constructed. This led to the standard legal-bureaucratic process of a request being filed for a building permit, this request being denied, an appeal being lodged, the appeal being denied and then, last July, a petition being filed at the High Court of Justice. The school and Bedouin community are represented by lawyer Yotam Ben-Hillel. In the petition, he argued that “in several Jewish settlements and outposts, there are schools and kindergartens that violate planning and construction laws. In many cases, these schools operate with the approval of Israel’s Education Ministry, which funds them and pays for their teachers. The [petition’s] respondents have no intention of demolishing these [buildings] for the sake of maintaining public order,” he wrote. The judges did not refer to Ben-Hillel’s claims of inequality – both in regard to planning and building opportunities given to Jews, in contrast to building prohibitions on the Palestinians; and the presence of unauthorized educational structures in the settlements and outposts that operate unhindered and are not threatened with demolition. Even before the ruling, Israel announced that the kindergarten would not be demolished. Regarding the school, the court gave the petitioners until February 1 to vacate the premises. In one final, desperate attempt to save it, the residents asked the Civil Administration to allocate the 2 dunams (0.5 acres) on which the school stands to them, in order to meet the public need for establishing educational institutions. They also asked to be excluded from the firing zone. They also presented a detailed plan for the school structure and asked for the demolition order to be frozen. They received no reply, whereupon Ben-Hillel filed a second petition last Wednesday morning. Justice Vogelman has instructed the state to reply within three weeks. Construction at the school has stopped. The yard remains unpaved and no stairs have been built to the classrooms. In the meantime, only 33 students – mainly girls – attend the unfinished school. The Tire School – which has been operating in the Bedouin community of Khan al-Ahmar for eight years – and the newer and lesser known school in Al Muntar point to changes occurring in Bedouin society. Parents want their children to study as much as possible, and to learn more than they did in their own childhoods. They particularly want their daughters to study and complete their high school education. The Bedouin, like all Palestinian residents in the West Bank, are under the civilian jurisdiction of the Palestinian Authority, including its law on compulsory education. However, communities lying in Area C are subject to Israel’s administrative and security control. This artificial and illogical division into categories A, B and C in the West Bank was meant to end in 1999. This did not happen, though, and Israel has persisted in prohibiting Palestinian construction in Area C, including the building of schools. Bedouin children have dropped out of school in Jericho, Al-Azariya and Abu Dis either because their parents could not afford to pay for transportation or because it’s difficult to walk several hours every day to reach school, in rain or blazing heat, across valleys and over steep hills. Through lack of choice, these and other communities decided to build structures without permits. The increasingly powerful settler lobby, spearheaded by the Regavim NGO and the Judea and Samaria subcommittee of the Knesset Foreign Affairs and Defense Committee, is applying greater pressure on the Civil Administration to implement demolition orders. It is not satisfied only with this, and is also insisting on the complete evacuation of Bedouin communities (as well as others in the south Hebron Hills area, such as Susya) from locations they have lived at before the West Bank was even occupied by Israel in 1967. 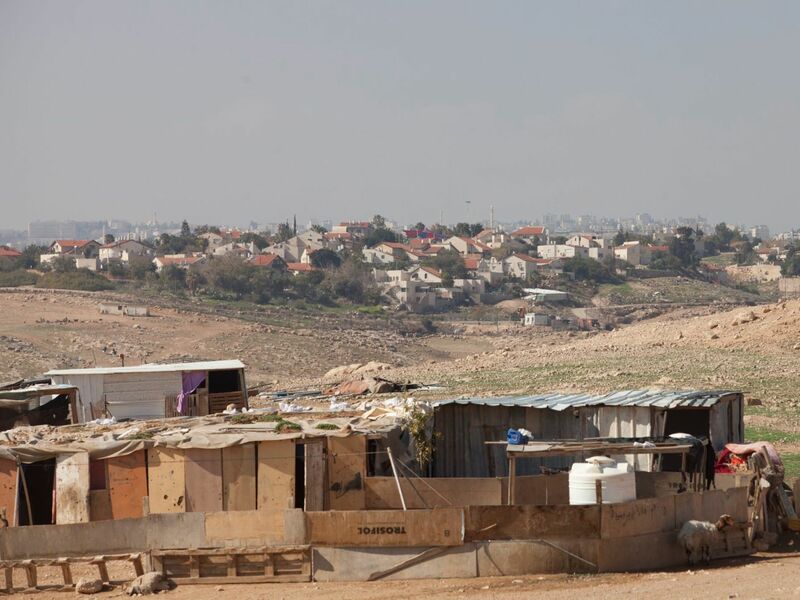 High Court petitions filed by Bedouin and other communities have delayed the evacuations, but their residents are living in increasingly constricted conditions. High Court justices debate the “illegality” of Palestinian structures, yet completely ignore the historical context and international laws that prohibit forced expulsion. These justices have never demanded that the state halt its discriminatory policies, which allow Jews to build in the West Bank while denying Palestinians that same right. 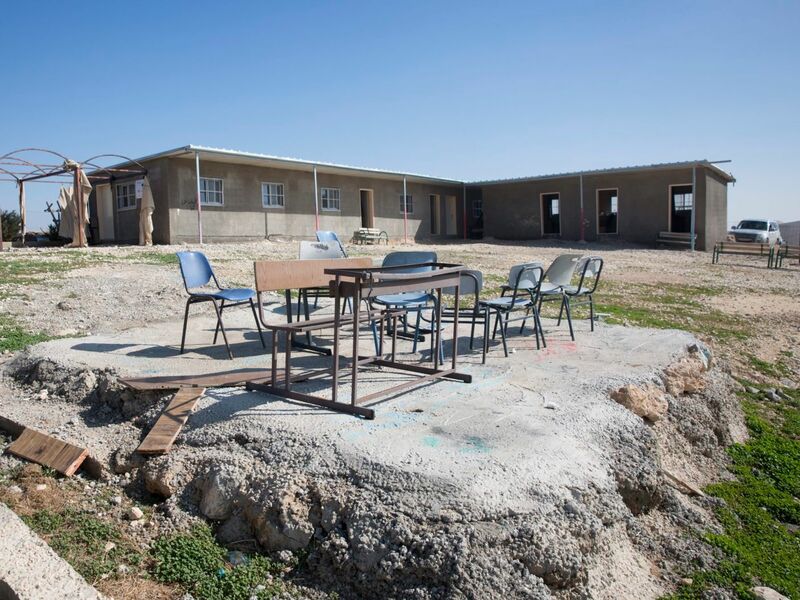 At the end of December, the justices ordered the demolition of the school in Al Muntar, although a fresh petition delayed its implementation. The justices still have to decide the fate of the Tire School and the Khan al-Ahmar community. It is not too late for the High Court to show civic and democratic courage by blocking these demolitions and forced expulsions. The justices can be inspired and encouraged by the efforts of a handful of settlers from Kfar Adumim who – contrary to the official position of their settlement – have decided to take action against the demolition of Khan al-Ahmar and its school.